It’s a new day, which means another adorable Alia Bhatt appearance to look forward to! We’ve always loved her sartorial choices, but what has really caught our attention more than her clothes is her hair. She’s been changing it up with each and every look. From intricate braids to the chic acorn bun, we give you some adorable Alia Bhatt hairstyles we are loving(and you would too!). The word boring just doesn’t seem to be in her dictionary. Rocking matching separates, Alia kept the accessories to a minimum and let her hair take centre stage. For this Alia Bhatt hairstyle, you need to make a French braid down the crown and make a fishtail braid as you go down. She looked adorable in this hairstyle! 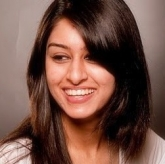 This tousled style works with your natural hair texture and requires minimum styling. 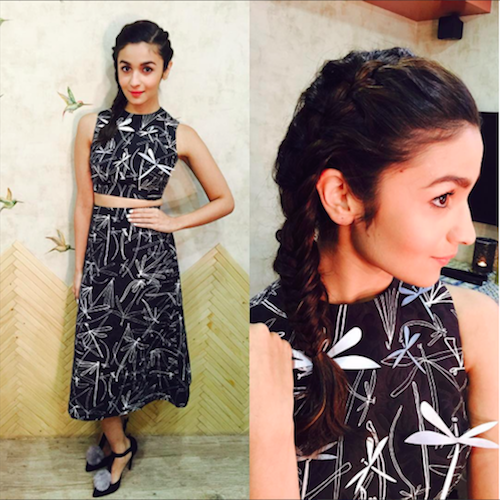 For this Alia Bhatt hairstyle, simply put down that straightener and gather your waves into this half-up half-down do. Use your fingers to get that messy look on the top. If you have straight hair, use a texturizing spray for the tousled effect. A rope braid is different from a normal plait, as it requires 2 sections instead of 3, to be twisted around each other. This hairstyle of Alia Bhatt requires you to take 2 sections of hair just above your ear and create a tight rope braid, before lifting it across your crown to the other side. 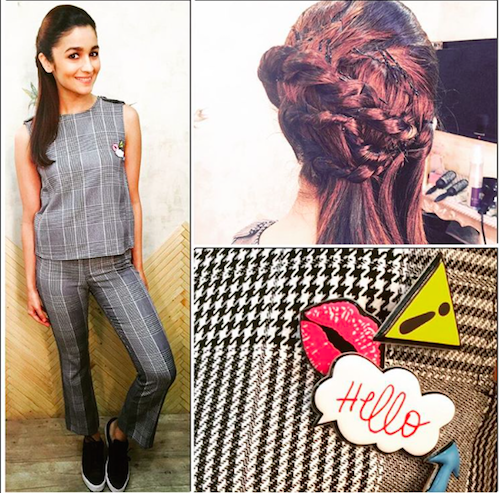 Secure it with a pin and channel some flirty charm just like Alia. Alia really outdid her hair game with these 3 simple braids. To get this Alia Bhatt hairstyle, just straighten your hair before creating 3 braids at the back and pulling them across and pinning them on the other side. 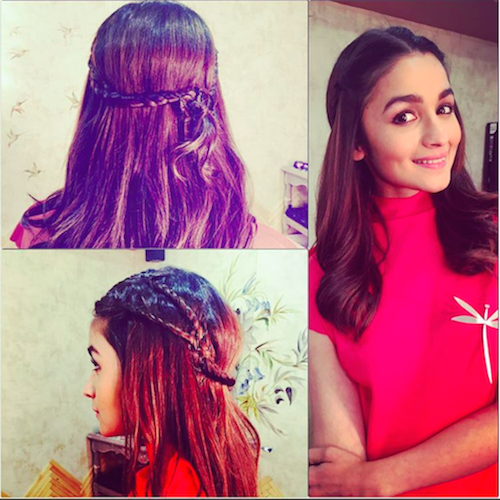 A super simple Alia Bhatt hairstyle to try if you want to look as adorable as this cutie. For this hairstyle of Alia Bhatt, you need to create a side part and take sections on either side of your parting that aren’t too thick but not too thin either. Twist each section before pulling them back across to the other side and using bobby pins to secure them. 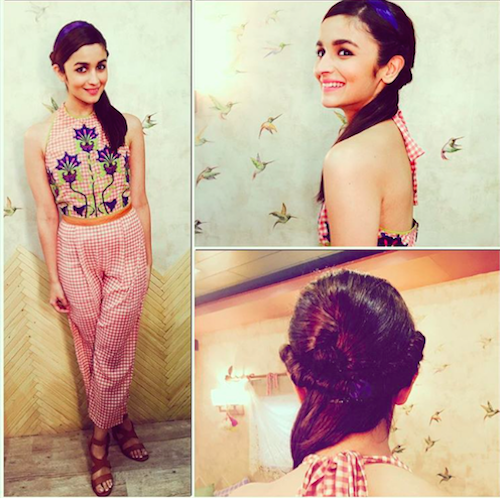 This Alia Bhatt hairstyle is such a fun way to beat the heat. The diva added a feminine touch to her sporty ensemble with her intricate do. This Alia Bhatt hairstyle may seem complicated at first, but it’s basically an assortment of rope braids and plaits pinned across the back of her head. Show this picture at your local parlour, or make sure to have a bevy of pins ready if you’re attempting this hairstyle of Alia Bhatt yourself. How adorable does she look in this cute dress? She paired the girly silhouette with a super simple style that is perfect for getting your bangs out of your eyes. For this Alia Bhatt hairstyle, just make a side parting, twist the front sections on either side of it and pin them back. 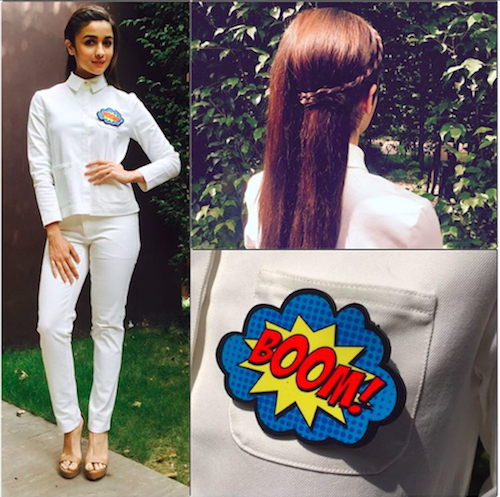 Who knew it was so easy to be as stylish as Alia Bhatt?! 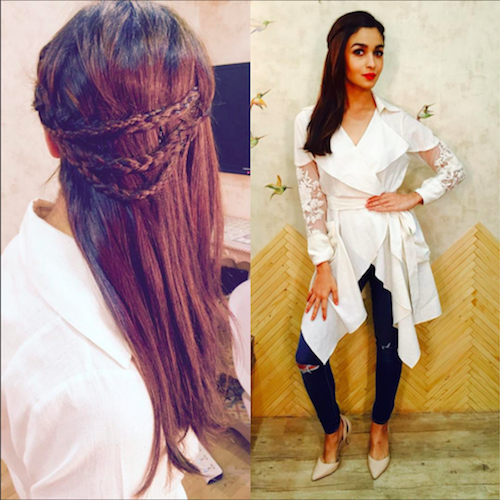 Adding some interest to an all white look, Alia pulled off yet another adorable braid. This Alia Bhatt hairstyle requires you to make a side part and French braid the front on one side, down your hairline before pinning it at the back and boom – you’re flaunting some girly chic, Brownie points to her for those super cool badges she’s been rocking. Imagine our surprise when Alia stepped out in a bun that most of us haphazardly pull our hair into when we’re lazing at home. Well, the acorn bun has turned into quite a celeb fave and we’re already pros at perfecting it. 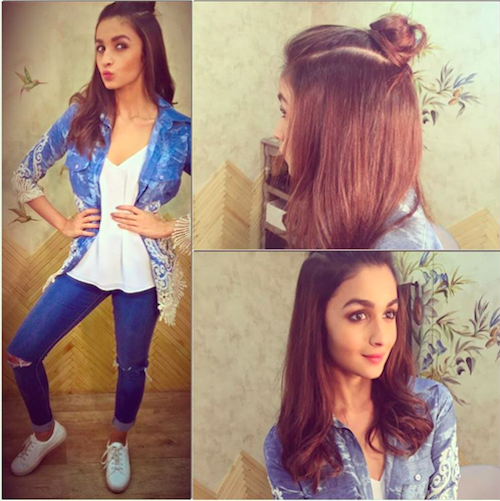 Try this hairstyle of Alia Bhatt for some casual chic in under a minute. Looking every bit the young fashionista that she is, Alia rocked a halo braid with a simple red shirt dress. Oh and special mention to that dragonfly brooch, it’s SO cute! To get this Alia Bhatt hairstyle, create a centre part to begin with. Then, make 2 braids on each side that converge into a single braid that runs across the back of your head. Pin it on one side at the back of your head and let the ends loose. Images: Alia Bhatt on Instaram MUST-READ: #GetTheLook: How To Get Alia Bhatt’s Greek Goddess Hairdo MUST-READ: Alia’s Moochh, Shahid’s Moves – This Shaandaar Song Is SO Cute!